While Koenigsegg is busy preparing to deliver the Regera hybrid hypercar to customers, the Agera RS was recently back in the limelight when it became the world’s fastest production car, achieving a top speed of 277.87 mph and beating Bugatti’s 0-249-0 mph record by some margin. 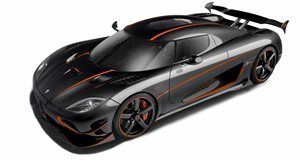 The Agera RS has been long sold out, however, with a production run limited to just 25 units. What you’re looking at here is one of the final one-off models based on the Agera, which was recently delivered to its lucky new owner. Dubbed the Agera RSN, Koenigsegg’s latest one-off supercar stands out thanks to its plethora of unique personalization options applied. The exterior features a two-tone blue finish complemented with visible carbon and white accents, creating a very eye-catching design. Carbon fiber also dominates the interior, combined with blue Alcantara. The proud owner has posted plenty of photos showing off their pride and joy on Instagram, and who can blame them after taking delivery of such a special supercar? While the standard Agera RS packs a 5.0-liter, twin-turbocharged V8 delivering 1,160 horsepower and 944 lb ft of torque, the one-off Agera RSN uses the optional one-megawatt engine from the One:1. This potent unit cranks up the power to 1,360 hp and 1,011 lb-ft of torque, which was enough muscle to beat the Chiron’s speed record. We suspect Bugatti will come back fighting soon to reclaim the crown with a more powerful Chiron Super Sport. Other one-off Ageras include the Agera XS and the Agera RS Naraya, which is covered in real gold.